…I also chose this drink because I’ve had the pleasure of visiting Wente in the past, a worthwhile field trip with my good bud and his wife out in the Livermore Valley. This is an airplane red, and those of you in the know are already picturing it being served just a bit too cold from the galley to really enjoy. That’s sort of the case here, but you make up for lost time by eagerly splashing your plastic cup–easily warmed stemware at its American Airlines finest. 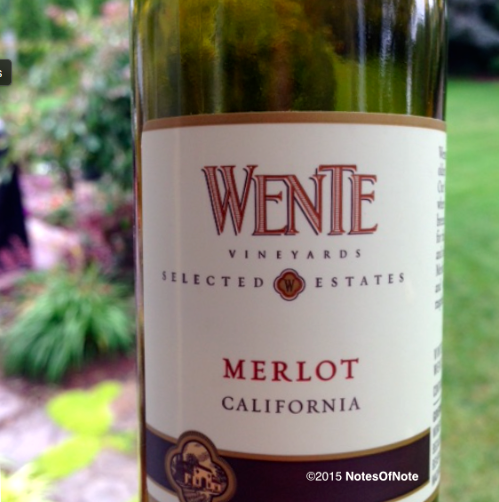 2014 Merlot, Wente Vineyards, Livermore Valley, California, USA. It’s a young grape, one without the deeper flavors (you can tell even before checking the year) or nuances yet juicy and fruity nevertheless. Enjoyable. The 2014 Merlot from Wente and its Selected Estates isn’t going to medal in any competition this weekend, but the family does good work, and you know some effort went into this red. It’s comforting. I sipped contentedly and wished away the miles and the encumbrances of a long work week–thoughts on the horizon and the fun weekend in store. This entry was posted in Merlot and tagged California, california winemaking, livermore valley, USA.